Nathan Gonelli is entering his second season with the Bravehearts. Originally from Baldwinville— a small town in Worcester County— Nate now lives in Gardner, MA. 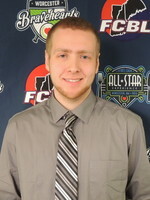 He is a 2016 graduate of Franklin Pierce University, earning his Bachelor's Degree in Sports and Recreation Management. While working on his degree, he worked and still currently works in the customer service industry. He has always had a great passion for all sports and was the first-ever Game Day Operations intern at the Franklin Pierce Athletic Department. He grew up playing street hockey, and he brings a hardworking, team-oriented, leadership mentality to the Bravehearts.